TWO ACTIVITIES in Hackney this Christmas stand out from the many that publicists are trying to promote. Hoxton Street Market is going slightly trendy again, as it did this time last year, and is also holding a carol service on Saturday 15 Dec 2012. Over in Clapton, Hackney’s “only vintage night market” will be held next Tuesday. Shoreditch and Hoxton churches will lead the carol-singing at Hoxton market and an outfit called Improvathon will Cockney it up with a singalong of Knees up, Mother Brown and other clichéd numbers. Some traders have been working Hoxton for years, in one case half a century, and Hackney council hopes the new breed of young stall-holders that it has lured will add seasonal buzz with their original and hand-made items. 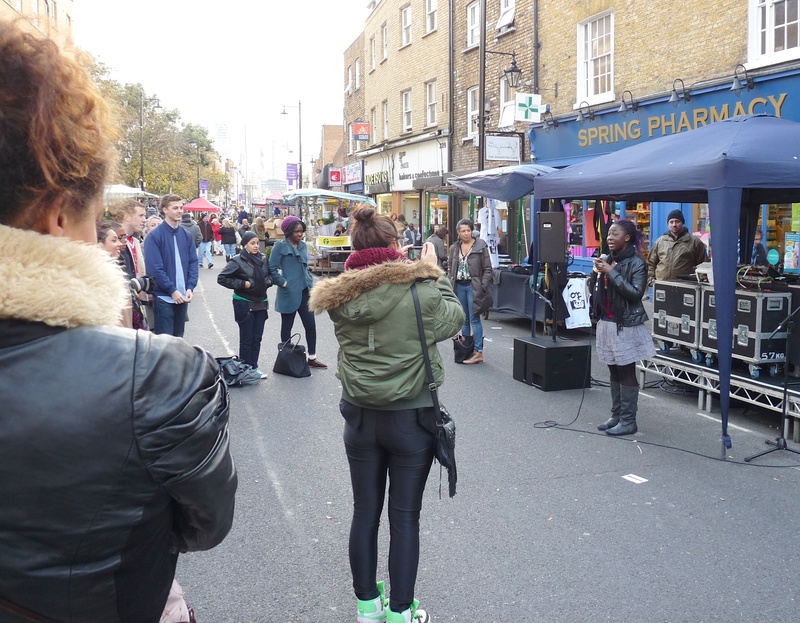 One of the organisers said: “We have been working with the council to improve Hoxton Street Market by contacting young, local creatives to take stalls in the hope that it will bring new custom to the market.” Local people may be a little uneasy at the thought of another Broadway Market. * Puckoo Couture makes clubbing-inspired clothing, including women’s tops and dresses from “upcycled” (I’m not even going to ask) garments and hand-made leggings. A pugmug can be bought for a fiver, a hand-knitted hats for £8 (£12 for adult size). The vintage night market, Dusty Fingers, will be held at the Grade 2 listed Round Chapel in Lower Clapton Road next Tuesday as an opener for a series to run on the first Tuesday of the month from March 2013. Claiming to have “sourced over 30 of London’s best vintage traders”, co-organiser Carolina Smilas promises “fashion, kitchen and homeware, furniture, lighting, rare radiograms and retro hi-fi equipment”. * Hoxton Street Market, Hackney N1 6SH, Sat 15 December 2012, starts this week at 9am. Carol service at 11am, singalong noon-2pm.